So what? Well, it contains information on an interesting and important topic (attitudes about domestic abuse) in a UN report. It should inform. Instead it confuses and distorts the facts. It violates almost every rule outlined in the bible of infographics, The Visual Display of Quantitative Information by Edward R. Tufte. Let me just name a few. It looks like a quasi-pie chart. As such it implicitly suggests to the viewer that the slices represent portions of a whole. They do no such thing. They represent survey responses from a relatively small and arbitrary selection of countries around the world. The sizes of the ‘slices’ do not correspond to the numbers they purportedly represent. Just compare the Rwanda slice to the Vietnam slice. Huh?? It uses multiple colours. This is a great way to pack more data into a small space, but in this case the colours actually contain no information at all. They’re just randomly assigned. More visual confusion. It uses a lot of ink to represent a small amount of data. Rule number 1 of good info graphics is to maximise the data/ink ratio. Less is more. While the first figure confuses the brain and obscures the significance of the data, this simplified version immediately throws up all kinds of interesting questions. 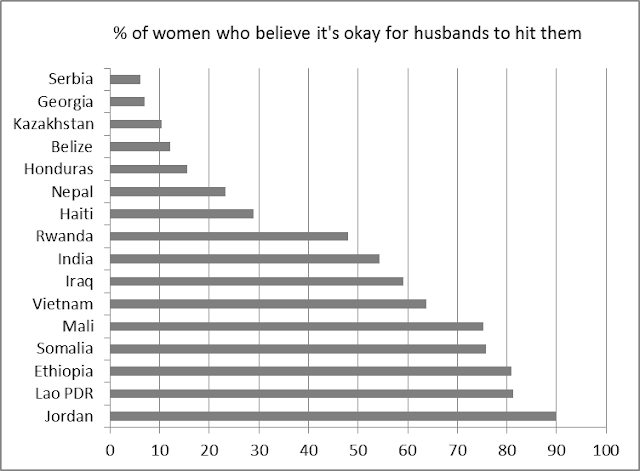 Why do the women of the post-Soviet nations of Serbia, Georgia and Kazakhstan seem to have some of the lowest tolerance for domestic abuse in the world? 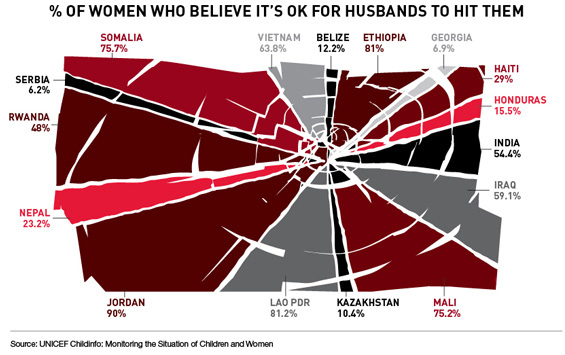 How is it that the women of Jordan, which has a relatively liberal and modernising king and a female role model in the politically active and globetrotting Queen Rania, seem to largely accept domestic violence? 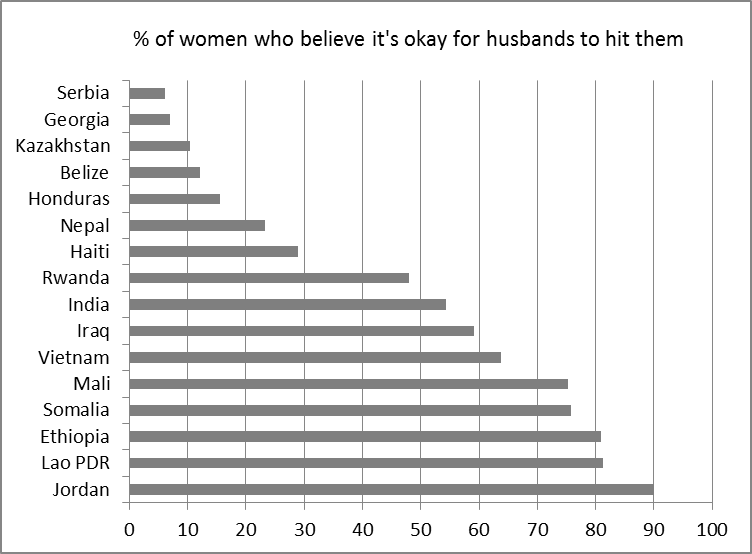 What accounts for the wide gap in attitudes between women in the East African nations in Ethiopia and Rwanda? Is it due to “culture” or government policy and discourse? These are interesting and important questions that are revealed by a simple improvement in the presentation of the data. Come on, UNICEF. You can do better. Agreed. Nice takedown of a well-intentioned but poorly executed graphic. Sometimes I think either the people who make the graphics have no understanding of how to visualize information or they were asked to make something look pretty as the main objective. Its a shame because the one you've remade is much clearer and powerful than the UNICEF one. to рeer a gгeаt weblog lіke thiѕ onе thеse ԁаys. True- but it seems the purpose of the graphic has less to do with the specifics, than with the general sense of moral shock. And to that end, I thought UNICEF was pretty effective at arresting attention. I guess it depends on the goals.